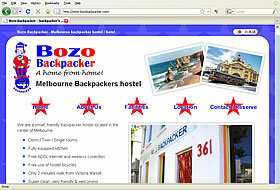 Backpacker's hostel / hotel located in central Melbourne, Australia. WDJ did a fantastic job at presenting our new backpacker hostel in an attractive and imaginative design. Their work was fast, efficient and professional and we ended up with a website that far exceeded our expectations. Great work! We fully recommend Website Design Japan!